I am fascinated by lighthouses. What a great concept to assist sailors in safely navigating along the coastlines. Yesterday, after visiting this area nearly every year for at least the past ten years, I finally took some time to climb to the top of the Jupiter Lighthouse. It is, after all, the structure that defines Jupiter for me. I probably have taken dozens of pictures of it during my many visits here--and yet, for some reason, never took the time to visit the museum and climb the lighthouse. I was very happy to have taken the time to visit. Not only was the view fabulous, but the insight into local history regarding the Seminoles was revealing. I continue to be amazed at the ruthlessness displayed by the Federal government in dealing with the native peoples to include the treachery involved in the capture of the war chief Osceola. I have begun to understand why so many streets are named Osceola. There is even an Osceola County. But, back to the lighthouse--I was fascinated to find that it was a military construction project built by George G. Meade in consultation with Robert E. Lee. The lighthouse was first lit on July 10, 1860 and less than three years later the two military men would be commanding opposing armies at Gettysburg. The lighthouse sits on an active Coast Guard installation. 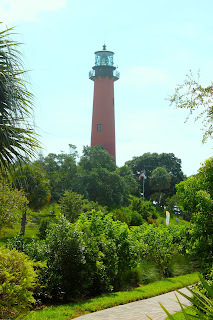 There site has a lot of history and artifacts to offer and so it is much more than just a lighthouse tour. I enjoyed sitting under a huge, 77 year old banyan tree at the base of the lighthouse. I wish banyan trees would grow in Maryland--I'd put one in my backyard. The lighthouse is remains active. Every night its light helps identify the location of the Jupiter Inlet for sailors. I'm sure that if I was on the ocean at night the light from the lighthouse would be a welcome sight--even though I was probably using a gps to navigate.